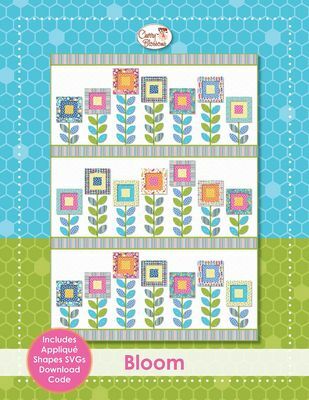 Bloom is a fun quilt that can be fused or hand appliqued. The easy to follow full-color pattern includes full size layouts diagrams, reversed templates, plus the download code for the SVGs (with a fabric prep guide to cut the appliques with your favorite electronic cutting machine). Cover quilt features Cherry's Front Porch fabric collection for Contempo Studios of Benartex. Finished size: 73 in x 101 in.